So the story began when I got a shock stepping on a weighing scale in my Hong Kong hotel room. I won’t tell you what it was, but safe to say it’s the highest since 2005. But of course I have already noticed that most of my dresses are getting too tight for the last couple of months. The reason: I have not been watching my diet and have definitely been eating out too much. I have also been suffering eczema for half my life, but the latest flare up on my right ring finger has been there for almost 6 months with vigilant corticosteroids use. To the point that I have to consciously hide the finger whenever a photo is taken. My nail bed is also affected as a result. I have read about the possibility of gluten and dairy causing allergies symptoms such as eczema, and this motivated me to research the Paleo diet (also called a Primal Diet). There are people who swear by the diet, not only for weight loss reason, but also for a myriad of health benefits. So what is Paleo diet (Paleolithic Diet), you might ask. Well back in the caveman days, us homo sapiens lived a hunter-gatherer lifestyle and generally ate meat, seafood, vegetables, nuts and fruits. The agriculture revolution has totally changed the way we eat and we now find grains everywhere: bread, noodles, pasta, rice, cereals, etc etc. It is believed that many people are still gluten intolerant as grains are actually ‘new’ to our diet. Gluten intolerance can manifest itself in many ways, varying in severity. Animals back in the days were not domesticated, so the cavemen/cavewomen did not consume dairy regularly. Refined sugars and processed food were definitely not part of our ancestral diet. As for legumes; well it’s a little more complicated, but basically they contains Phytic acid that prevent us from absorbing the nutrients from our food (like grains and pseudograins). They also contain a type of carbohydrate called galaco-ligosaccharides that can cause unpleasant digestive problems for some people, especially people who already have IBS or similar digestive problems (another tick for me as I suffer from IBS sometimes). Basically, a typical Paleo meal consists of protein (eggs, meat, fish etc) with plenty of vegetables. Nuts should be occasional snacks. There’s absolutely no need to starve myself, which is great. I’ve had fun coming up with tasty paleo dishes and most of them are pretty straightforward and simple. Today, I had this frittata for lunch. 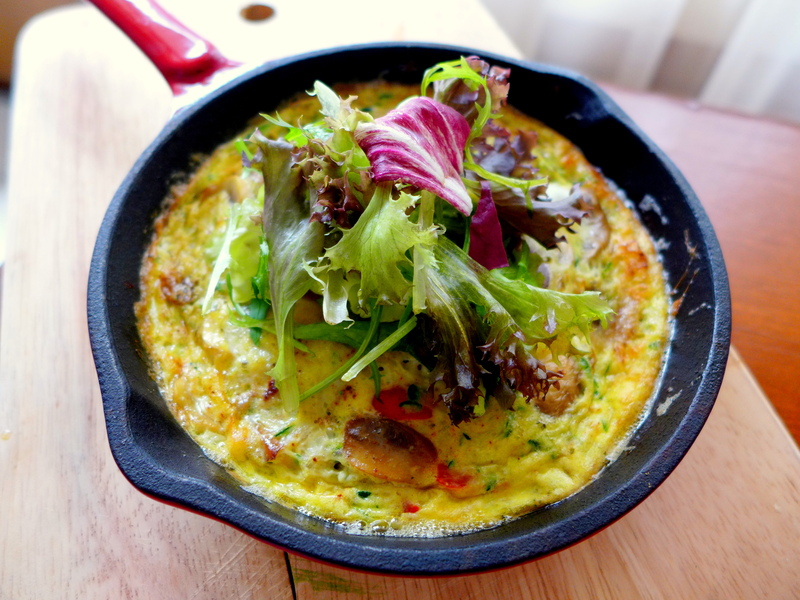 Frittata is perfect for days when you want a quick and nutritious meal but too lazy to go out for groceries. You can use pretty much any vegetables in your fridge. You can even add bacon (yes bacon is allowed on Paleo diet, rejoice! ), or salmon, to bulk up the protein content. 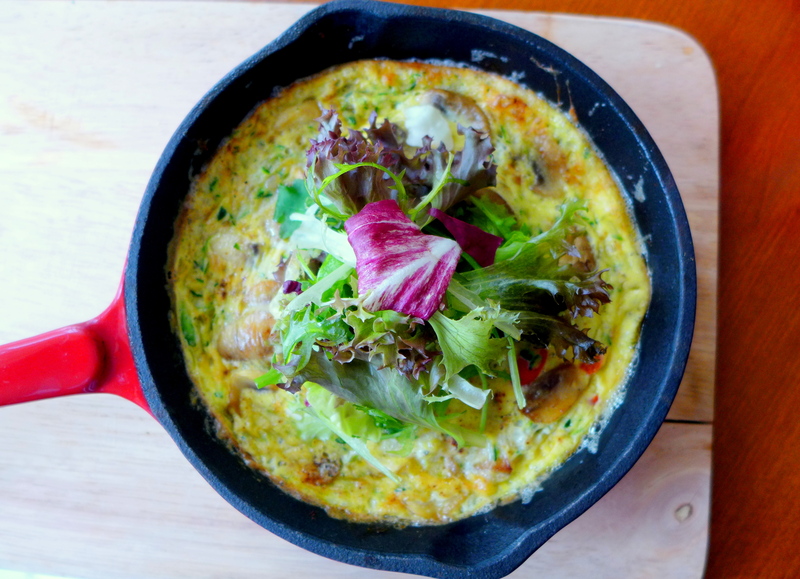 Today, I had mushrooms, zucchini and capsicum in my frittata. I have also made it with pumpkin, eggplant, leeks, spinach and cherry tomatoes. As for the cooking time? It’s no more than 20 minutes! Heat olive oil and teaspoon of butter in pan and first saute the onion until translucent. Add mushrooms, capsicum and minced garlic and saute for a couple of minutes. Add spices, followed by zucchini. Preheat the oven to 180C, top heat only. Meanwhile beat 2 eggs together and season with salt and pepper. When the vegetables are ready, transfer to a small cast iron pan (you can also use a large ramekin or round baking dish), return to heat and pour over the egg. Distribute the vegetables evenly and cook for about 1 minute or 2 until the bottom of the frittata has set. Put the frittata into the oven and grill for 5-8 minutes until the top is slightly golden brown. Let cool slightly, garnish with salad leaves and squeeze the lemon juice over the leaves. Simple technique, simple ingredients, yet the result is delicious and nourishing. Try this at home if you feel like pampering your body. Paleo diet doesn’t have to be boring, that’s for sure. I aim to do this for at least a month. I can tell you that after just 3 days, my finger has already started to heal. It’s now looking almost normal again. Should have tried this ages ago! More recipes to come and feel free to suggest dishes for me to cook. It’s going to be fun selecting things to eat whenever I’m out dining, hehe. KIV, gotta try this. Looks so good. Hahaha yeah! Eating out is bad for waistlines! Oh wow…this is so healthy and delicious. I am still quite skeptical to go about so many type of veges at once..ahhaha. Meat…roar!! 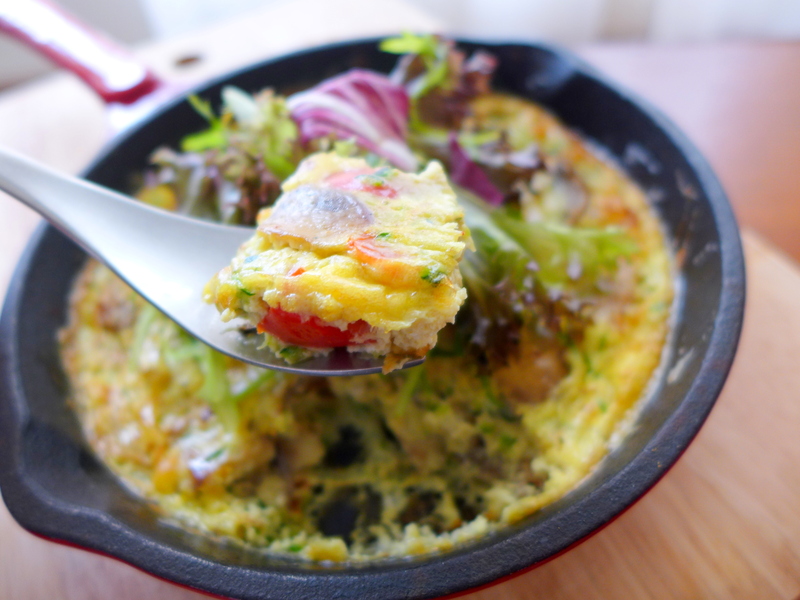 I love the cooked vegetables in your frittata and fresh veggies on top a nice contrast! I’m trying to avoid carbo for my dinner and this will be great recipe for me! Yeah I’m not a fan of cold salad unless I have it as a side to a main dish. Cooked vege dishes are much tastier!